O que significa a expressão TO SHOT FROM THE HIP? I don't want to be harsh but I can't bear one more second of Mary's sensitiveness anymore. What happened? I thought you guys had hit it off pretty well. Well, me too. But then I got to know her a little bit better and I realized how much of a flower she is. I need to be very careful with every word and reaction I have with her or else she will be extremely offended. I've had enough of this. Well, maybe it's just your nature to shoot from the hip. Definitely not. You know me better than that. Although I tend to be very frank to people, I've learned to be more careful with her, but she still manages to hang on every word I say. She must be mad at me about something I said. You can give me a million dollars to find out what it is and I'll have no clue. 1. Lit. 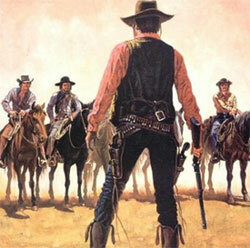 to fire a gun that is held at one's side, beside one's hip. (This increases one's speed in firing a gun but is muchless accurate.) When I lived at home on the farm, my father taught me to shoot from the hip. I quickly shot the snakebefore it bit my horse. I'm glad I learned to shoot from the hip. 2. Fig. to speak directly and frankly. (Alluding to the rapidness of firing a gun from the hip.) John has a tendency toshoot from the hip, but he generally speaks the truth. Don't pay any attention to John. He means no harm. It's just hisnature to shoot from the hip. Your family has owned a grocery store for many generations. Your parents were given the responsibility to take care of it by your grandparents a few years back and, just like you expected, your turn is just around the corner. You see your mom and dad getting older and you're just a few months from graduating from business administration, the major you were pretty much doomed for. It's pretty obvious that the torch is about to be passed to you. But wait, who is going to pass the torch to you? And what does that mean? Now imagine you decide to hang out with a male friend from college at a bar on a weekend. It's just supposed to be a hangout and the purpose of you two meeting up is above all discussing a project you guys are involved in due two days from then. The unexpected started to happen when he out of nowhere caressed your hand and looked at you like never before. How could you ever imagine he would pick that day to make a pass at you? Now you wonder if there's really such a thing as true friendship between men and women. 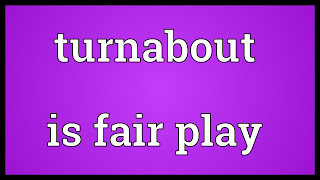 O que significa a expressão "TURNABOUT IS FAIR PLAY"? Imagine you've been tormenting the life of one of your classmates during the whole semester and everything seems to be doing pretty fun for you. Actually, you are not the only bully. It's you and your gang from the back of the class. When the semester ends and your gang gets gets tired of mocking that specific guy, they turn their back at you and do what you would have never expected in a million years: They start bullying you! Now you run from your old gang and look for rescue in the one that used to be your old target. Here's what he says: So you don't like to be made fun of! Well, turnabout is fair play. Prov. It is fair for one to suffer whatever one has caused others to suffer. Try to think of this other situation: You and your roommate usually share the household tasks and today's your housemate's laundry's day but he refuses to cooperate. Here's your complaint: I did the dishes yesterday and even this morning. You do it this time. 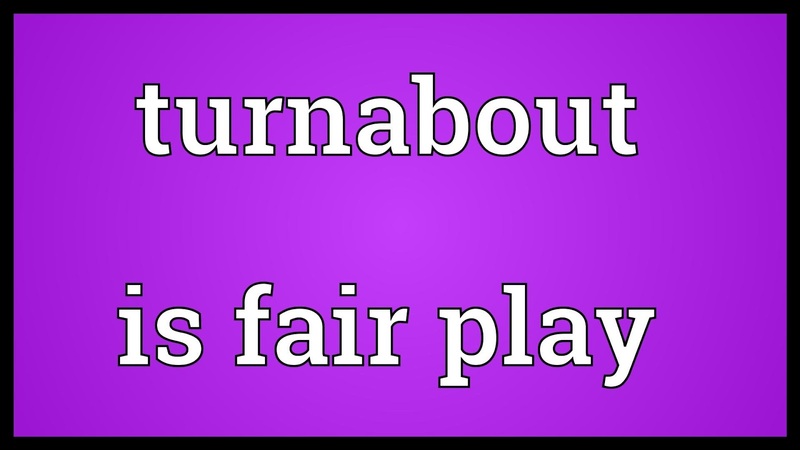 Turnabout is fair play. O que significa a expressão TO GO/JUMP THROUGH HOOPS? _My instructor expects me to jump through hoops for him before he allows me to get my license. I've had enough of this! O que significa a expressão (STRAIGHT) FROM THE HORSE'S MOUTH? -You can definitely believe me! Like I said, I heard it straight from the horse's mouth. It was the boss who said those things. It wasn't just anybody. 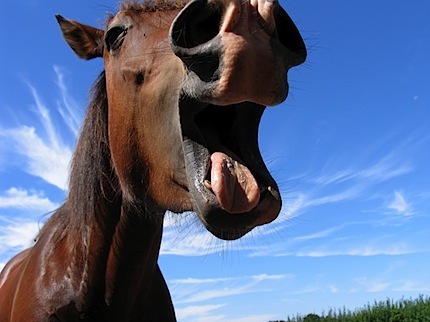 If you get an information "straight from the horse's mouth", you get it from someone who is involved in it and who knows a lot about it. Hello, guys. Today I'd like to bring you two expressions with the word pet. I'm not going to list them this time. Instead I will talk about them using situations to try to help you understand when and how to use them in your everyday speech. So without further ado let's get started! Imagine everyone has a few things in their lives they hate. Just like favorite things they have in life that they love, they have favorite things that they hate. Those kinds of things we can call pet peeves. So if you stop to think about most often encountered annoyances, you may come up with: people that don't signal, people that cut lines, people that come into the theater after the show has started, people that chew with their mouth open, and so on and so forth. If I was to think of my own pet peeve, I would say one of my most frequent ones would be people acting intolerant and biased. What are your pet peeves? 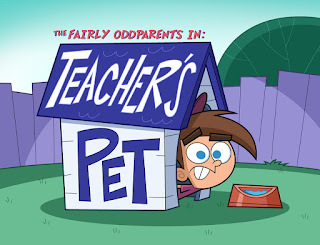 The second expression with the word pet takes me way back to my school days. When I was in the last year of Elementary School, I remember there was this girl in my class that my Math teacher would offer preferential treatment. And it was not like she was always currying his favor in hopes of better grades. It's just that she had been established as the teacher's favorite pupil by the teacher himself. Everybody called her "teacher's pet". That's an expression you use to talk about someone who has gained favor with any kind of authority. Have you ever been a teacher's pet? Let me know in the comment's section. Talk to you next time! -I was wondering if you have those shoes up there in my size. -8.5. I really hope you have it because they look really awesome and I can't find them anywhere else. -I'll check that out and I'll be right back with you. Please take a seat, I won't take long. -Today's your lucky day ma'am. 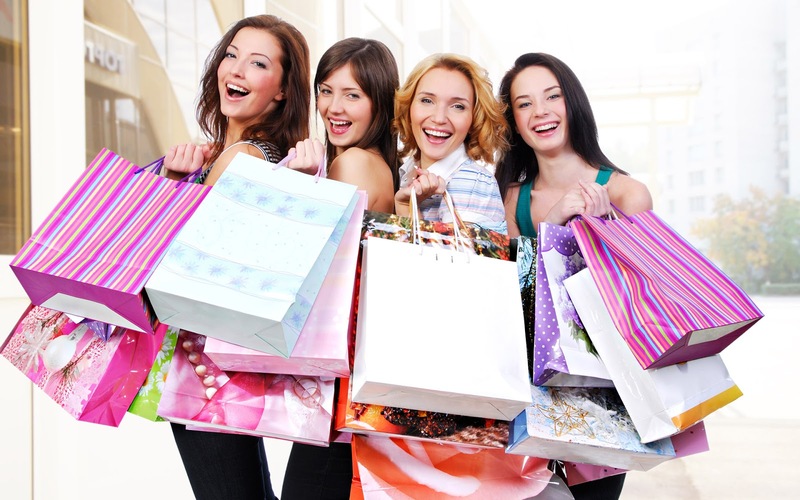 Not only do we have those shoes in your size, but also most of our items in the store. -I'm in kind of a hurry now, so I'll only take those today. What's the sale price on this? -Oh, that's already its sale price. It's a real bargain if you compare it with other stores.Will that be all for you today? -What is your payment method going to be? -What are the ones that you offer? -Credit cards, debit cards, Apple pay. -Sure. How many installments do you wish to make? -2... no, 4... no, wait! I guess I should pay cash. Here's the money. -Alright. Here's your receipt. Have a good day! to ponder of: pensar em relação a algo numa maneira mais cuidadosa. Porém, tenho que chamar atenção pra algo. Apesar de na música termos a preposição of, a expressão mais aceitável seria to ponder upon ou ponder on. Sendo que esta é mais informal que aquela. Veja este exemplo: I've been pondering on the meaning of life lately. ought to: este é o único verbo modal acrescido de to. Se você não está habituado com os verbos modais e até com o próprio conceito gramatical, clique aqui e você será encaminhado prum post que tratará especialmente disto. Ought to e should passam essencialmente o mesmo sentido, sendo que ought to tem um tom mais formal. Os sentidos são de conselho, obrigação, dever, etc. Por exemplo: You ought to give her a gift. It's her birthday. (conselho) you ought to wear seat bealt. (obrigação). slot: abertura. Neste caso, a abertura do painel do carro que dá espaço para colocar o rádio. I find it hard: eu acho difícil. Você pode está se perguntando porque a existência do it nessa sentença. A resposta é simples: O verbo to find é transitivo e, portanto, sempre necessitará dum objeto. Nesse caso, it. Mesmo que no Português nós o ometimos, o Inglês exige a presente dele ali. Veja mais alguns exemplos: I find it awesome the way you speak in public. I found it depressing how they talked to me the other day. over: percebça que também podemos usar a preposição over no sentido de "ao longo de". Nesse verso, temos: Eu descubro ao longo de nossa existência humana, mas você pode também conferir esse outro exemplo: Energy consumption patterns have changed significantly over the history of the United States. I liked it better: eu gostava mais. Mais um exemplo de verbo transitivo que precisa do objeto it pra ter ser sentido completo. come across: este phrasal verb tem mais de um significado, mas nesse contexto, significa "parecer ser", como em: He comes across as an intelligent person. Um outro significado muito comum desse phrasal verb é "achar algo por acaso", como em: I was cleaning out my room and I came across a lost picture of me in High School.